Hebrew scholar of Warsaw; died there between 1870 and 1880. Besides his edition of David Franco Mendes' "Gemul 'Atalyah" (Warsaw, 1860) and of Pappenheim's "Agadat Arba' Kosot" (ib. 1863), to both of which works he added notes of his own, he edited the "Megillat Antiokus" (ib. 1863), using as a basis therefor Filipowski's edition of 1851, and adding to it an introduction and notes. 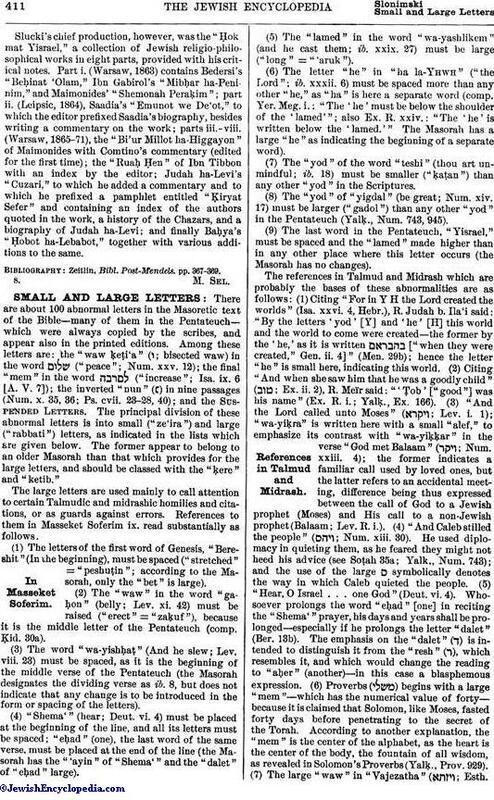 Slucki's chief production, however, was the "Ḥokmat Yisrael," a collection of Jewish religio-philosophical works in eight parts, provided with his critical notes. Part i. 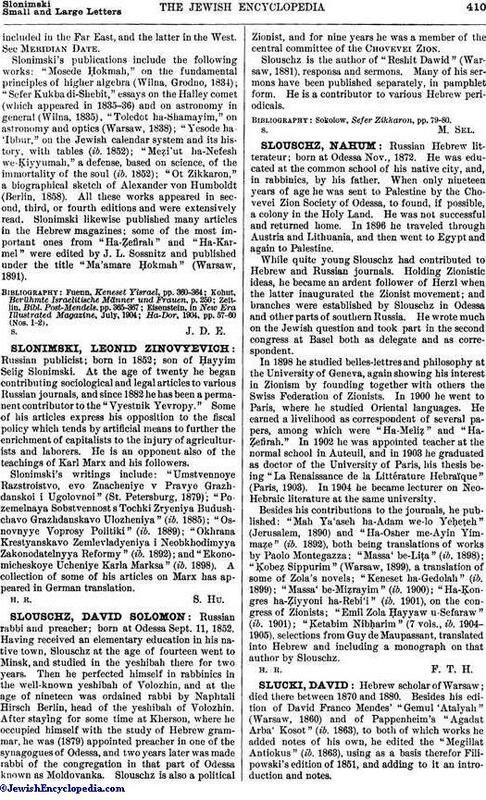 (Warsaw, 1863) contains Bedersi's "Beḥinat 'Olam," Ibn Gabirol's "Mibḥar ha-Peninim," and Maimonides' "Shemonah Peraḳim"; part ii. (Leipsic, 1864), Saadia's "Emunot we De'ot," to which the editor prefixed Saadia's biography, besides writing a commentary on the work; parts iii.-viii. (Warsaw, 1865-71), the "Bi'ur Millot ha-Higgayon" of Maimonides with Comtino's commentary (edited for the first time); the "Ruaḥ Ḥen" of Ibn Tibbon with an index by the editor; Judah ha-Levi's "Cuzari," to which he added a commentary and to which he prefixed a pamphlet entitled "Ḳiryat Sefer" and containing an index of the authors quoted in the work, a history of the Chazars, and a biography of Judah ha-Levi; and finally Baḥya's "Ḥobot ha-Lebabot," together with various additions to the same. Zeitlin, Bibl. Post-Mendels, pp. 367-369.